The rates above are per person, and based on double occupancy. For single occupancy please add $150 per day. Call us for child and companion rates. We will make every effort possible to accommodate trips of a shorter or longer duration. Please ask for our assistance with these requests. Some conditions apply. 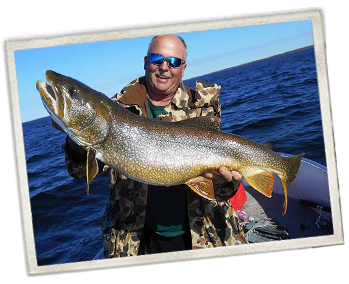 Ever wondered what it would be like to fish for monster lake trout and actually catch them in 3-5 ft. of water? Well, the answer is quite simple. It’s absolutely amazing!!! The last week of August and the first couple of weeks of September will see these huge female lake trout move to shallow rocky reefs and points in anticipation of their yearly spawn. These magnificent fish are displaying their full fall spawning colors that can only be seen at this special time of year. And if you think they are sluggish during this period, you are sadly mistaken. They absolutely crush any bait that catches their attention and fight like they have full intentions of winning the tug of war battle. Whether you are using a 5-7” streamer fly or trolling an assortment of large spoons, the results are the same, catching huge trout. We have yet to find a spoon that is too big for these monsters, and a 5 of diamonds is as good a spoon as any. We use single barbless hooks for easy releases, and practice CPR (catch, photograph, and release) to make sure this incredible fishery remains strong and sustainable for not only us, but for the next generation as well. 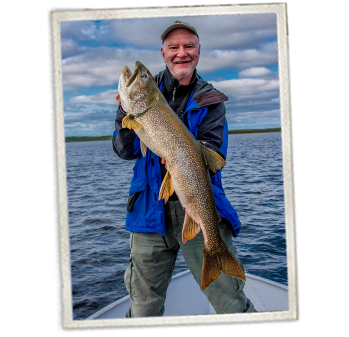 The average size of the trout varies, but you can be rest assured there are tons of trout in the 35-40” class and many that are in excess of 45”. 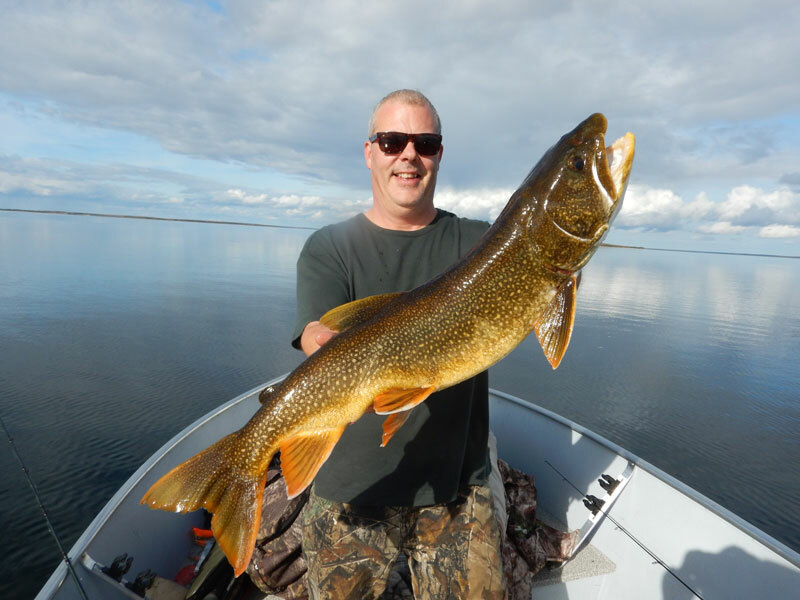 During a period of 1+ day, a lucky group of hunters that were all tagged out on their caribou hunt had over 50 Manitoba Master Angler Lake Trout (minimum master angler for lake trout is 35”). What an incredible experience to have one of these monsters on your line, get it all the way to the side of the boat only to have the fish slip off the hook. But no need to worry because in most cases they won’t usually go too far and if you jig and move the spoon around in the shallow water, they will most likely attack it again with the same vengeance as it did in the first place. We are extremely fortunate to have crystal clear water on our lakes, giving you the best seat in the house to view all this crazy action. 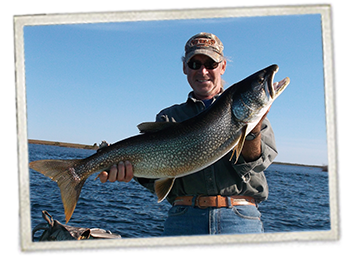 On top of the fantastic fall lake trout fishing, The Lodge at Little Duck still have some of the best pike fishing to be found anywhere in Canada. These predators are constantly stalking these shallow waters looking to beef up as much as possible to ensure they make it through the cold water season, which as you can imagine, lasts quite a while in the north. Arctic Grayling are also available in big numbers this time of year, and can be fished in the relatively calm waters of the Wolverine River, which just happens to located right behind The Lodge at Little Duck. The grayling are also looking to beef up before winter arrives and can be caught using many different techniques. It is not unusual to have a 16 inch grayling on the end of your line only to have a huge lake trout come up and completely swallow the grayling. After that……the fight is definitely on. 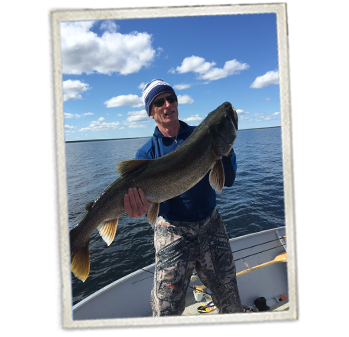 Whether your game is fly-fishing, trolling, jigging or casting, there are plenty of ways to take advantage of the incredible fall fishery we have at The Lodge at Little Duck. A deposit equalling 50% of the total package is due within 14 days of booking. Deposits are non-refundable and non-transferable. All remaining balances are due in full 60 days prior to your trip date. If booking a year in advance, a $1,000 deposit is due within 14 days of booking. On January 15, (the year of your trip) the deposit needs to be brought to 50% of the total package price with the remaining balance due 60 days prior to arrival. Full payment of reservation is due on all bookings made less than 90 days prior to arrival. Deposits and final payments can be paid with personal or business cheques along with money orders. Visa and MasterCard payments are also accepted; however, these transactions will be subject to a 3% surcharge. The initial deposit is due within 14 days of booking, and once received; your reservation is considered confirmed. If secondary (where applicable) and final payments are not made by the due date and in the amount outlined on your invoice, your reservation may be cancelled and your deposit withheld. If the cancellation of a trip is necessary, deposits can be credited towards another trip within the same calendar year only if space and availability exists. We strongly suggest the purchase of travel or trip interruption/cancellation insurance. Some companies require this coverage to be bound within 14 days of your first deposit, so please check carefully with your insurer as to their requirements for this type of insurance. Guests that miss the chartered scheduled flight to The Lodge at Little Duck are financially responsible for their own transportation to The Lodge, and on to Edehon Lake Camp. 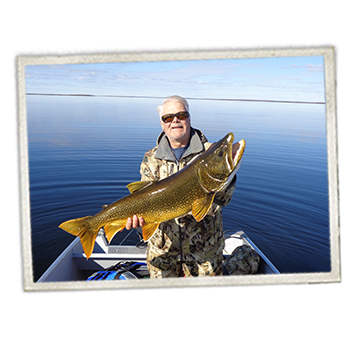 Guests must overnight in Thompson Manitoba the night before their scheduled flight to the Lodge. Once your trip is completed, we make every effort to have you back in Thompson by 11:00 am on the day of departure. Please try to make all southbound air connections to Winnipeg late afternoon/early evening. The Lodge at Little Duck Ltd., its owners and staff make every effort to satisfy our guests. We will assume no responsibility or liability for any hazard of any kind associated with these trips. Neither is any obligation or responsibility assumed for any political, meteorological, family, climatic, mechanical, or other circumstances or for the actions of transportation companies, contractors or other principles for which The Lodge at Little Duck or Tundra Investments Ltd contracts. All hunting activities will be carried out in a sporting, fair chase manner, which does not imply or express any guarantee with regards to the harvesting of any game animal. As with all hunting trips, there is a slight chance that the sought after game animals may not be present during your hunt period. This scenario is beyond the control of The Lodge at Little Duck Ltd, and therefore, will offer no guarantee, discount or reimbursement of any kind for this situation. All applicable regulations/laws with respect to angling, hunting and the safe use of firearms will be strictly adhered to. By sending a deposit to The Lodge at Little Duck Ltd for one of our hunting/fishing trips, the guest is acknowledging that he/she has read and fully understands the terms and conditions above. Every effort is made for the charter flights to run on time, however, safety is paramount and the decision to fly or not is not made by The Lodge at Little Duck and remains beyond our control. We will assume no responsibility for missed flights due to weather.